Size: Starfish is 3.25 inches across! 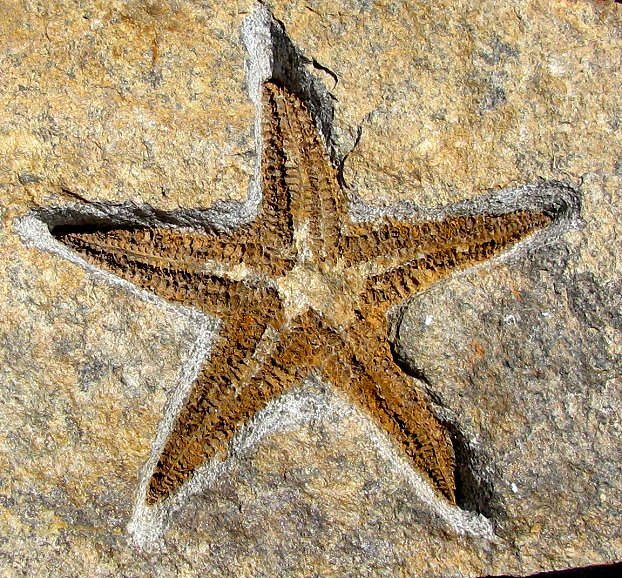 This is an amazing fossil starfish specimen from the Ordovician of Morocco. This plate contains a beautiful, complete Petraster starfish. The fossil sea star exhibits incredible detail - all five of the long arms are intact, and the plate structure is very easily seen - it is extremely unusual to have all of the arms intact and splayed out like this! The fossil has excellent, natural orange coloration which contrasts strikingly with the light brown matrix. The huge starfish is well displayed and beautifully showcased on the large, natural block of sandstone. This is a very large, top quality, highly collectible true starfish fossil from North Africa - what a display piece!